Happy Halloween! I wanted to use the scariest ingredient I could think of to make this drink, so I chose Campari, because although it does not scare me, many people seem to be averse to it. I personally enjoy challenging ingredients; I see them as new territories to conquer. James and I had a meal at a Seattle restaurant called Altura, where they served us an aperitif consisting of blood orange juice, carrot juice, and Campari in a miniature hurricane glass. It was only a taste, but the flavor of carrot and Campari paired surprisingly well. Perhaps it should not have been a surprise, as Campari contains the flavor of bitter orange peels, and carrot orange juice is a classic Moroccan combination, with a bit of ginger. For holidays, I always like to do something a little bit special (just wait til Thanksgiving, wherein I will garnish a drink with a whole roast turkey…maybe), and James and I had been tossing around the idea of using a gourd as a serving vessel for a while. A raw gourd has sour, savory, and vegetal notes, and we were worried that it might strike a dissonant chord with a mixed drink if we used it as a vessel. The realization that made this whole thing come together was that the flavor of carrot juice could work as a bridge between the gourd vessel and the other flavors in the drink, provided that they mixed well with carrot. OK, I’m done. And I’m sorry. 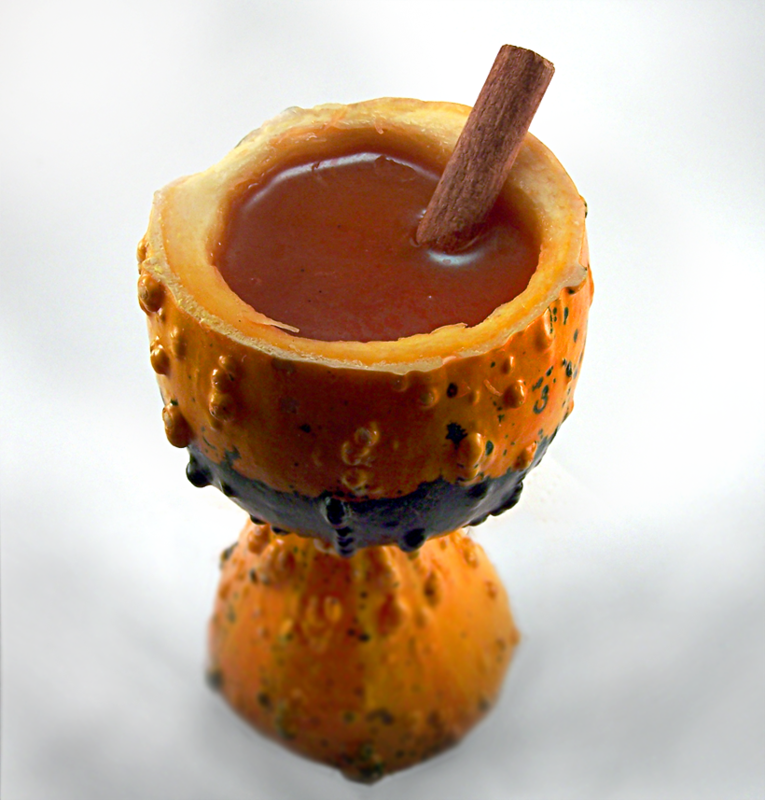 Shake over ice and double-strain into a chalice made out of a freaking gourd. Garnish with a cinnamon stick and a sense of accomplishment. As with many fresh juices, carrot juice has a mild flavor, easily overpowered by the more robust qualities of common cocktail ingredients. I had to add a full two ounces before it could stand up to the bourbon and cinnamon syrup. The quantity of Campari in this was also counter-intuitive, but when you are creating a cocktail, the rule is add a little bit, taste, add a little bit, taste. It’s a process that won’t always take you to the place you expect. Categories: original creations | Tags: alcohol, bartending, booze, campari, carrot, carrot juice, cinnamon, cinnamon syrup, cocktail, cocktailc, craft cocktails, drinking, drinks, juice, liquor, mixed drinks, mixology | Permalink. Joseph, you have outdone yourself! What a magical vessel you’ve created there! The drink sounds quite good, too. I’ve been working with carrot lately, but rarely to much success. I’ll have to try this one! Excellent stuff! Gourds should be drunk from more often. Great photo! This idea is perfect for Thanksgiving celebrations. I will definitely be making my own gourd chalice to drink from. Wow that looks tasty and halloweeny. One of my favourite things about halloween is the themed treats. Ahh, you were Freshly Pressed! Congratulations, that’s fantastic! This looks like a tasty drink. And you can always get fresh gourds for thanksgiving. Congrats on being pressed. As a general rule for me Campari with its dark red color is a little too bitters for me. I think this much Campari would make this drink way to bitter! Freaking. Awesome. I love this idea, and who’d have thought…from a GOURD?! I will most definitely be trying this as I also love experimenting with new food items! My kids and I made a homemade pumpkin pie from local pumpkins..less exciting than the gourd but still cool! I blogged about it too! http://bit.ly/SyrRzM . Thanks again for sharing! Whoa…while I probably won’t make the drink because I’m too lazy I just wanted you to know that I absolutely love your gourd vessel!! Thank you so much for suggesting these five things. I will be publishing these on ?? on the blog http://www.5thingstodotoday.com. Please have a look when they are up. I would love you to spread the word about my blog using facebook/twitter etc. Maybe some of your friends would like to contribute. Thanks again and keep in touch. David. 1. Your punnery is fantastic. 2. Your gourds are to dine for 3. Great site, mix on. Congrats on being Freshly Pressed, sirrah! I always appreciate a new way to use my Campari, so I’m looking forward to trying this (and testing to see how different the gourd chalice makes the flavor). Is the cinnamon syrup your 3 cinnamon sticks, 1.5 c sugar, 1.25 c water blend? Yes, that will work nicely. Well. I was forced to use a Sweet Dumpling squash, since the crooknecks were all gone. My juicer let me down where the carrots were concerned, but fortunately Bolthouse Farms had my back! My roommate and I tried both Elijah Craig (nice) and Evan Williams Cinnamon (which she enjoyed, but I found a bit overpowering cinnamon-wise). I might still dial back the Campari, but I think this ties the Union Club for Campariability ^_^. Thanks! My roommate also really appreciated the name. Well done all around. I caught this on Freshly Pressed. Pretty ingenious and creative. For those of who are not big drinkers, how would you describe Campari’s flavor? Also, from a pure flavor perspective, how well do you think the gourd vessel idea (again, I love it) work with other items? Maybe I just have it on my mind, but I am thinking a sweet potato bread pudding with a splash of bourbon. Campari is a bitter liqueur. It tastes kind of like bitter grapefruit peels, but really it’s its own thing. The flavor of the gourd is very mild, but it has a squashy smell. I think it would go just fine with sweet potato bread pudding. what an amazing found on freshly pressed! this looks freaking awesome! very creative indeed! Those are lychees, of course! If you have never tried one, they are delicious. Make sure to get a fresh one, though. The canned kind lose a lot of brightness. Gourd Vibrations! haha love it. Great post and congrats on being Freshly Pressed!! Any cocktail that uses carrot juice is healthy in my books. Must try this one. Hats off for originality.